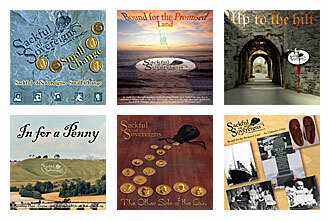 Titanic and the Goodwins - Sackful of Sovereigns - Based in Melksham, Wiltshire in the heart of rural England, Sackful of Sovereigns is a five piece electric folk band performing their own original material and modern arrangements of Traditional English Folk Music. In 1912 the Goodwin family, from Melksham, decided to emigrate to Canada to start a new life. 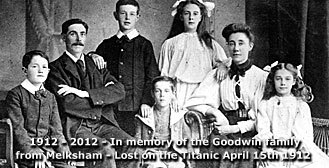 By a number of twists of fate they ended up sailing on the ill-fated Titanic and were all lost with the ship except for Sidney Goodwin, the baby of the family, who has been identified as "The Unknown Child" who was buried in the cemetary in Halifax, Nova Scotia. In the spring of 1912 The Goodwin Family, from Melksham, had decided to emigrate to Niagra Falls, Canada to give their children a better start in life. The England of 1912 must have appeared to be crumbling. There were strikes and riots throughout the country with the army shooting striking miners in Llanelli and Liverpool. The family were originally due to sail in the Easter week but due to the disruption caused by a coal strike they postponed their trip. They made new arrangements to sail on the "SS New York". It appears that the miners strike contributed again to their fate as, due to the coal shortage, they were transferred to the "Titanic" along with all the available coal. Ironically, as the "Titanic" was leaving Southampton it nearly collided with the "New York" when the smaller ship's moorings broke and it swung into the path of the passenger liner. It missed by just four feet! At 11.40pm on Sunday 14th April 1912 the "Titanic" struck an ice-berg and sank just over two and a half hours later. No-one knows what became of the Goodwin family. Only that no trace of them has been found (except for Sydney who has been identified as "The Unknown Child") so it is assumed that they went down with the ship. They were a popular family in Melksham and there is a plaque in St. Michael's church in their memory.